Each year, Congress develops a federal budget, which establishes funding for each federal department and agency for the following fiscal year. This determines how much funding agencies like the NIH have to support scientific research through grants, as well as in their own labs. A federal law, the 2011 Budget Control Act (BCA), placed stifling caps on spending that have threatened funding for the NIH and other agencies. These caps are blunt tools that batter crucial national priorities, compromising security, prosperity, and progress. Because the caps established by the BCA are so low, Congress has raised them repeatedly to allow sufficient funding for federal agencies. Unfortunately, those “caps deals” were temporary. Unless Congress acts again, we’re looking at a cut of approximately $55 billion to non-defense discretionary spending in the next fiscal year, which guarantees trouble. If the cuts are distributed evenly or no budget deal is reached, then NIH and every other public health and science agency faces a cut of about 10%. In the case of NIH, that would mean a cut of as much as $4 billion. Achieving another agreement to raise the budget caps is crucial, time-sensitive, and not by any means a sure thing. You don’t need a laundry list of the negative consequences on science that these cuts would engender. Suffice it to say that promising research will be choked off, fewer new grants will be funded, and medical and other scientific progress will slow dramatically. All this during a time of unprecedented scientific opportunity, when other nations are already nipping at our heels and would surely attract more and more young scientists if the U.S. signaled lack of support. Starving research is not the solution to what ails us — literally or economically. Your voices, your story, and your expertise are needed now. Tell your friends, colleagues, and Congressional representatives why medical progress, public health progress, and science itself are crucial, and why federal funding for these priorities is so important. Research!America, supported by partner organizations including ASHG, has created resources for you to advocate for federal research funding. Additional resources and tools to urge your representatives to #RaisetheCaps are available on ASHG’s Advocacy Center. This week, ASHG and eight partner organizations issued a position statement outlining whether, and to what extent, there is a responsibility to recontact genetics and genomics research participants when new findings emerge that suggest their genetic information should be interpreted differently. Today, ASHG and partner organizations issues a statement in AJHG addressing the responsibility to recontact research participants. Variants of uncertain significance get reclassified at a relatively high rate – up to half of such variants have been reclassified in the past decade. One paper found that 12% of these reclassifications had the potential to alter clinical management. We sat down with Yvonne Bombard, PhD; and Howard Levy, MD, PhD, lead authors on the statement, to get their take on the issue. ASHG: Why did the Social Issues Committee tackle this topic? Yvonne: Genetics and genomics researchers are at the forefront in collecting and analyzing data related to sequence variant interpretations, which is continuously evolving. This means that a variant’s clinical significance might be reinterpreted over time as new evidence emerges regarding its pathogenicity or lack thereof. This raises ethical, legal, and financial issues as to whether there is a responsibility to recontact research participants to provide updates on reinterpretations of variants after the initial analysis. While clinical recommendations on the responsibility to recontact research participants with such reinterpretations have begun to emerge, the Social Issues Committee decided to tackle this topic because there is a lack of guidance on the responsibility for researchers. We were fortunate to have collaborative partners on our Workgroup from clinical, research, and laboratory settings across various countries and jurisdictions. The statement reflects their synergistic efforts and the care these members took to carefully craft a comprehensive set of recommendations. Howard: Perhaps the most obvious but most important concept in this position statement is the recognition that recontacting individuals to keep them abreast of new knowledge is a desirable and laudable goal. The problem is that we live in a world of limited resources, and the cost of achieving this goal can be onerous. As Yvonne points out, there is only limited guidance on recontact in the clinical arena, and none in the research arena. ASHG and our partner organizations are fortunate to count among our memberships expert clinicians, researchers, laboratorians, educators, counselors, social scientists, bioethicists, lawyers, and patient advocates from around the world. We are uniquely suited to address this topic with the broadest possible representation and perspective. There is a long history of thinking about clinical care and research as independent, non-overlapping contexts. But in recent years we’ve been recognizing and grappling with the reality that the lines between the two are blurry and sometimes not well-defined. In genetics, many of us serve in both roles concurrently, which can create real or perceived conflicts of interest. It is incumbent on all of us to work as hard as we can to be aware of these potential conflicts and respond appropriately. Having principled and evidence-based guidelines upon which to rely is an invaluable resource in helping us to evaluate these situations and determine the right course of action. ASHG: What are the key differences between the research and clinical contexts? Howard: While the intent of biomedical research is ultimately to improve or maintain health and avoid, treat, or cure disease, the proximal goal is to generate knowledge that forms the foundation of that ultimate benefit to society. Direct benefit to individual research participants is wonderful when it occurs, but is not the primary purpose of the research. Conversely, clinical care puts the benefit of the patient front and center as the primary goal. Thus, in the clinical context, recontact can be argued as furthering the goal of maintaining information and informed consent, so that individual benefits can be maximized and individual harms minimized. But in the research context, the ethical desirability of recontact is not as strong, because the main goal is generation of new knowledge, not individual benefit. In fact, recontact in the research context can be argued as ethically undesirable if the recontact consumes so much resource that the research itself can’t be completed. In addition, while there are mechanisms available to seek at least partial financial compensation for clinical recontact on a case-by-case basis, there is no such funding mechanism in the research context. Yvonne: The workgroup carefully considered differences between the research and clinical contexts to determine a reasonable set of floor/ceiling recommendations, balancing these imperatives across research and laboratory settings. We also developed a decision tree, which walks a researcher through whether and how to implement these recommendations within their particular research context. ASHG: What factors affect the strength of the responsibility to recontact? If the interpretation of a given variant is related to the condition under study or reasonably expected to affect participants’ medical management, the Workgroup recommended that there is a strong responsibility for researchers to attempt to recontact participants to offer updated results. If the reinterpretation is not expected to affect medical management, recontact is advised rather than strongly recommended. Conversely, the statement recommends that there is no responsibility for researchers to hunt or scan the genomic literature for changes in variant interpretation, and that any responsibility to recontact should be limited to the duration of research funding. Additional recommendations address the practicalities of informed consent, involvement of institutional review boards, timeliness and protocol of recontact, and structuring of future research studies. Howard: Clinical utility to the participant is prioritized higher than personal utility or benefit to family members. And issues of practicality have to be considered, too. Some of these judgments may be subject to bias, and we therefore encourage consultation with and input from IRBs, ethics boards, and clinical consultants. ASHG: How might advances in IT address practical challenges in fulfilling this responsibility? Yvonne: Advances in IT will likely reduce the opportunity costs of recontact and open up new avenues of keeping patients and research participants informed. Most electronic medical record systems and many clinical laboratories now offer portals through which patients might see their data, interact with clinical, laboratory, and support staff, and access educational material. As our IT resources and our databases continue to evolve, it is plausible that much of the effort of recontact could become automated. When a variant is reclassified, an automated notification could be sent to all patients and research participants known to harbor that variant, alerting them of the revised interpretation and prompting them to log into the portal to view the new information and associated material. Howard: As the volume of identified and re-interpreted variants continues to increase, IT solutions will be critical to handling these immensely large numbers at scale, at much lower cost, and more rapidly than doing so manually. IT solutions can also reduce the risk of biased or uneven approaches to attempting recontact. Humans may consciously or subconsciously vary their method of communicating information, and sometimes make mistakes in adhering to informed consent, research protocols, and other policies governing the recontact process. An automated, algorithmic approach is still subject to human bias and error in creating and implementing the rules that drive the process, and is obviously not as personal as direct human communication, but is by definition consistent from case to case. ASHG: What infrastructure would be needed to maximize the impact of such IT advances? Yvonne: This future vision depends upon well-developed and interoperable databases, including both the interpretations of the variants and the lists of who has each variant. Potentially difficult questions about identity and privacy will need to be answered. There are also significant concerns about the “digital divide” and economic disparities; increasing reliance on IT solutions has the potential to create disparities among people who are unable to or choose not to utilize such resources. There will always be situations that require more nuance and explanation than an automated algorithm can achieve. But there is hope that IT enhancements can significantly lower the costs and barriers to recontacting research participants when it is considered desirable to do so. Howard: Perhaps more challenging than creating the infrastructure of standardized and interoperable databases will be establishing societal and cultural expectations surrounding privacy, security and sharing of the data, and developing the necessary IT tools to collect, maintain, revise, and respect individuals’ preferences regarding such data sharing. With all of that in place, patient-facing portals built into IT systems and yet-to-be-developed apps can deliver timely and relevant information to consumers who choose to receive it, and pair that information with additional education and support modules to help them make the most of that information. Yvonne Bombard, PhD, is an Assistant Professor at the University of Toronto Institute of Health Policy, Management and Evaluation; Director of the St. Michael’s Hospital Genomics Health Services Research Program; and Scientist at the St. Michael’s Li Ka Shing Knowledge Institute. Howard P. Levy, MD, PhD, is an Associate Professor in the Division of General Internal Medicine & McKusick-Nathans Institute of Genetic Medicine at Johns Hopkins University. AJHG: What prompted you to start working on this project? Nancy: I presented some of the preliminary studies from this work at a work-in-progress meeting at Vanderbilt, and Ela Knapik, who directs the zebrafish core here, saw the presentation and asked the question at the end, “Why don’t you knock out GRIK5 in zebrafish?” And so we talked afterward and agreed to collaborate on this project. I expected it to take forever — I was totally unprepared for how rapid CRISPR can be. But it has been a fantastic collaboration and we are working together on several additional really fun projects now. AJHG: What about this paper/project most excites you? Nancy: Trying to understand how polygenic contributions to disease work is challenging because the effect sizes for any individual variant are quite small. This was a different kind of discovery because we had used a gene-based method and found associations to a pattern of phenotypes, not just a single diagnosis. I think that helped to us to focus the follow-up to the zebrafish studies more broadly and think about how we might test for a relationship between vascular development and eye disease. AJHG: Thinking about the bigger picture, what implications do you see from this work for the larger human genetics community? Nancy: I hope that people will begin to think more seriously about using very large-scale phenome information from electronic health records as an adjunct to genetic studies, which we can afford to do in only smaller numbers of individuals. The biobank at Vanderbilt is big — 250,000 subjects, but there are many more (millions) with quality phenome information but no DNA. Finding ways to use both should stretch our ability to make and extend discoveries. AJHG: What advice do you have for trainees/young scientists? Nancy: One of my mentors used to remind me on a regular basis that there is no shortage of interesting things to do in science — things that are so interesting they are hard to resist. But only a subset of those things are also important with respect to bigger picture questions or implications for other parts of biology. You have to continually ask yourself whether what you are doing is both interesting and important to insure that you are able to continue, and be funded, to do research that you find irresistible. AJHG: And for fun, tell us something about your life outside of the lab. Nancy: I really love the music scene in Nashville! It is amazingly diverse, and we take advantage of the opportunities to hear great music every chance we get. Nancy Cox, PhD, is Director, Vanderbilt Genetics Institute; Professor of Medicine, Division of Genetic Medicine; Director, Division of Genetic Medicine; and Mary Phillips Edmonds Gray Professor of Genetics at Vanderbilt University. She was the ASHG President in 2017. My first few months as a Genetics Education & Engagement Fellow, which have included rotations at the National Human Genome Research Institute (NHGRI) and ASHG, have been full of lessons, new experiences, and opportunities to increase my skill set. At NHGRI, I’ve learned more about government agencies and how they work. I’ve begun to develop partnerships across the National Institutes of Health (NIH) and the surrounding community, and have seen that the NIH is a collaborative environment, and how small the genetics community is in the DC area. At ASHG, I have discovered some of the roles of scientific societies and the importance of member relationships. I have seen the behind-the-scenes work required to build a community and plan valuable events. I’ve had the opportunity to participate in and even spearhead events helping to increase genetic understanding and health literacy in different communities. My major project while at NHGRI was the NBC4 Health and Fitness Expo. This project required immense collaboration and preparation. Though weekend snow covered the streets of the district, we were still able to educate and engage over 200 community members and talk to them about genetic risk assessment, direct-to-consumer genetics, basic genetics and genomics, and some of the things that happen at NHGRI. Seeing the public converse about how genetic health history impacts their lives was a highlight for me. It’s so important to show those who may not have a vested interest in science how it impacts them and affects their day-to-day lives. This was not my only project that focused on facilitating and increasing genetics education and engagement. Shortly after starting my rotation at ASHG, I was able to help find and develop tools for ASHG members that aid them in answering questions about genetics and genomics from nonscientific communities. 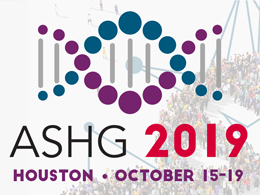 ASHG is a trusted source for up-to-date genetics information and my hope is that members of ASHG can locate resources that help them answer and respond to public inquiries. I have also had the opportunity to speak with budding scientists through an event organized by the Johns Hopkins Center for Talented Youth program. I served as a panelist and talked to gifted high school students about my career and educational experiences in the field. This event allowed me to speak on the importance of genetics, genomics, and health literacy, and to bring awareness to the importance of understanding these topics. It was great to see so many young people excited about science and the influx of different career options available to budding scientists. I’ve also had the opportunity to help increase diversity at NHGRI by helping to find and recruit committee members from diverse populations who have a vested interest in genetics and genomics. The fellowship is just getting started. I know that there will be even more opportunities to learn, serve, and develop as a scientist and educator. Interested in the intersection of genetics with education and public engagement? Consider applying for the ASHG/NHGRI Genetics Education & Engagement Fellowship! Applications are open through April 19, 2019. Life as a Genetics & Public Policy Fellow: Hello from the Hill! Around this time last year, I was putting the finishing touches on my dissertation and trying to coordinate a date for my thesis defense. This week, I helped prepare a United States Senator for an event on drug pricing and met with constituent groups on issues ranging from cancer research to school nutrition. This dramatic and exciting shift was only possible because of the ASHG/NHGRI Genetics & Public Policy Fellowship. Throughout most of my time in graduate school, I knew that I wanted to pursue a career in science policy, and was looking for an opportunity that would allow me to apply my scientific expertise in rare diseases and preclinical drug discovery in a policy setting. The Genetics & Public Policy Fellowship was a great fit with my background and interest in exploring multiple spaces within the policy world. So far, I’ve had the chance to work in both the executive and legislative branches of the U.S. government, and later this year I’ll complete my fellowship with the Policy and Advocacy team at ASHG. I’m currently about six months into my fellowship, and am happy to report that the experience so far has been just as excellent as I had hoped. I started my fellowship in September within the Policy and Program Analysis Branch (PPAB) at the National Human Genome Research Institute (NHGRI). Right away, I got to jump into several projects the branch was working on, including drafting the Institute’s Fiscal Year 2020 Congressional Budget Justification, an important step in NHGRI’s being funded each year. This was a great way to learn about many of the research projects funded by NHGRI and write about them in a way that was concise, engaging, and accessible. I also helped organize feedback from the wider genomics community that was collected as part of NHGRI’s ongoing strategic planning process. A highlight of this rotation was presenting a poster at the annual NHGRI Symposium. My PPAB colleagues and I described some recent studies on public perceptions of the use of genetic data by law enforcement (particularly for solving cold cases) and discussed potential policy options to address genetic privacy. After surveying symposium participants on their own views on this topic, we learned that while the NHGRI community was mostly supportive of the use of genetic data for law enforcement for solving crimes, they overall reported having more concerns about their genetic privacy than do members of the general public who have been surveyed. This January, I started my second fellowship rotation, in the office of Senator Richard Blumenthal from my home state of Connecticut. I work with two other staffers on the health and education portfolios, including issues related to biomedical research. Within the health space, I’ve worked on a wide range of issues, including antibiotic stewardship, e-cigarettes, prescription drugs, and dietary supplements. In education, I’m working on issues related to social and emotional learning and oversight of predatory colleges and universities. So far, I’ve been involved in both long-term projects in these areas as well as the day-to-day business of the office. I really enjoy getting to meet with Connecticut constituents to discuss their priorities and concerns – I feel like I learn something new every meeting and it’s fascinating to get to hear about so many different topics. Another major part of my job as a fellow is drafting bills, letters, memos, and briefings for the Senator to help him prepare for events. Putting together memos and briefings is probably where my research and analysis skills from graduate school are most valuable. These documents need to succinctly synthesize what a particular event is about, what stakeholders are involved and what their perspectives are, what past legislative or oversight work the Senator has done in that issue area, and what message he should try to get across in his remarks. Overall, I really like the pace of my office and the scope of issues I work on, and I’m looking forward to what the next few months will bring! As I look back on the past six months, I realize how valuable this fellowship has been for my career and professional development. I’ve solidified my interest in pursuing a path in science policy, and thought more specifically about what kind of professional positions I might like to pursue in the future. I’m constantly refining my communication skills, particularly in writing for different audiences and purposes. I’m improving my project and time management skills, and learning to how to prioritize short- and long-term goals. Maybe most importantly, I really like what I’m doing! This fellowship has shown me first hand that I can apply my scientific training outside of a research environment in a way that’s both personally and professionally fulfilling. I would definitely recommend this fellowship to any early career genetics professionals who are interested in careers in policy. Beyond getting to do the kind of awesome work I talked about here, you’ll benefit from mentorship and support from the whole community of fellowship alumni. Thank you to ASHG and NHGRI for making this experience possible, and I can’t wait to see what the rest of my fellowship brings! Interested in applying for the ASHG/NHGRI Genetics & Public Policy Fellowship? Applications are open through April 19. National DNA Day started in 2003 to commemorate the completion of the Human Genome Project and engage communities with science. Last month, ASHG hosted the webinar “Take Initiative: DNA Day Engagement and You,” which covered how to get involved, resources, and best practices. Listeners were joined by moderator Maurice Godfrey, Incoming Chair of ASHG’s Information & Education Committee; Carla Easter, Chief of Education and Community Involvement at the National Human Genome Research Institute (NHGRI); and Christina Vallianatos, Founder and co-Director of Michigan DNA Day. National Events: Carla described larger DNA Day-related events that NHGRI oversees. Students are able to visit the NIH Campus and go on lab tours, and NHGRI facilitates interactive programming with the Smithsonian Institute, a lecture, and a seminar series. Past events are listed online, and 2019 events should be available soon. Maurice encouraged listeners to get involved in ASHG’s Annual DNA Day Essay Contest. This year’s contest addresses the disclosure of a genetic diagnosis to one’s family. Participating students can win cash prizes and funding for their science programs at school. Genome.gov offers a starter kit to move DNA Day programming further in your area. They also have a map to find events in your area and lists of interactive activities. The ASHG website has tips for the DNA Day Essay contest, lesson plans, and lists of outside resources. Michigan DNA Day’s website is a great place to start if you’re considering going into a classroom for DNA Day! There’s information for teachers, scientists, and students. An overarching theme was to make your interactions as hands-on as possible. Christina says that when engaging with students, it should be “less about teaching and more about the interaction with science.” If students are given something physical to do, it’s more likely to stick with them. Similarly, Maurice kept activities hands-on and interactive when developing a DNA Day program for the Omaha Zoo and Aquarium’s “Key to Diversity in Animals and People Festival,” a larger event that lasted a whole weekend. Want to get involved or find more resources? Email ASHG at dnaday@ashg.org, NHGRI at dnaday@nih.gov, or Michigan DNA Day at midnaday@gmail.com. Submissions for the ASHG DNA Day Essay Contest are due March 8, 2019! If you’re a member of ASHG and interested in getting involved in science engagement, sign up for the Genetics Engagement & Education Network or contact education@ashg.org. ASHG and the National Human Genome Research Institute (NHGRI) co-sponsor the Genetics & Public Policy Fellowship to give genetics professionals an opportunity to contribute to the policymaking process. If you’re interested in the development and implementation of genetics-related health and research policies at a national level, then this Fellowship may be right for you. Applications are open now through April 19, 2019. Questions about what the position is like? Read on for real-world details from past Fellows about their experiences. How is the position structured? The Fellowship lasts for 16 months, during which time the Fellow rotates through three positions within the Policy and Program Analysis Branch of NHGRI, a congressional office of a member of Congress or a committee, and the Policy & Advocacy Department at ASHG. This allows Fellows to gain experience in different roles of national policymaking and decide which aspects of policy and work settings they are interested in pursuing as a career. Cari Young, 2015-16 Genetics & Public Policy Fellow, walks us through her experiences. What kind of work will I do? While it depends on the needs of each organization at the time of arrival, 2017-18 Fellow Nikki Meadows gave us a look into her work during two of her rotations through several blog posts. 2017-18 Fellow Nikki Meadows discusses advocacy with members. During her rotation with the Senate HELP Committee, Nikki organized a panel of genetics experts to answer questions from congressional staff working on health issues. This allowed her the opportunity to network with seasoned geneticists and help enhance the scientific knowledge of congressional staff. At ASHG, Nikki also provided updates to members on important policy issues such as the federal biomedical research budget and genetic privacy. She additionally promoted the ASHG Advocacy Center and encouraged scientists to make use of these vital tools, both at the 2018 Annual Meeting and through online forums. Will this position help further my career? The rotational aspect of the position is a huge bonus to many applicants. 2015-16 Fellow Cari Young said, “This Fellowship provided a unique opportunity to take on varied roles within the science and health policy landscape, allowing me to experience the pros and cons of working in each setting and helping me to crystallize my thinking on where I might want to go next. It also made me a more marketable applicant for policy positions beyond the Fellowship.” As Fellows gain experience in different areas of public policy in just 16 months, it is a vital starting point that lays a solid base. What kind of jobs might I get afterwards? Check out our policy fellowship page to see where all our past Fellows are working now! Our Fellows have gone on to positions at the National Institutes of Health, the U.S. Food and Drug Administration, the White House, and a number of other organizations focused on science and health. Applications are open now through April 19, 2019. Apply today!